It’s nearly impossible to hang around foodies these days without hearing the words organic, sustainable, or some form of the word local (locally sourced, buying local, locavore). Well, today I’m going to propose a new type of backyard crop that’s all of these things – you might even have some in your backyard already. Most people know that bamboo grows like a weed in hot climates like the ones found in Texas, so there’s no need for fertilizers or pesticides to get it to grow (containing it might be another issue). What many people don’t know however, is that bamboo is an excellent and delicious food source. While we can’t eat bamboo straight-up like pandas do, billions of people around the world (mostly outside of the United States) find boiled, freshly sprouted bamboo shoots to be delicious (see the recipe at the end of this post). What’s the first thing that comes to mind when you think of Australia? Crocs? Shrimps on the barbie? Koalas? Whatever you think of, kangaroos can’t be far down the list. I recently took a vacation down under and the bizarre food eater in me had a craving for unique food experiences. 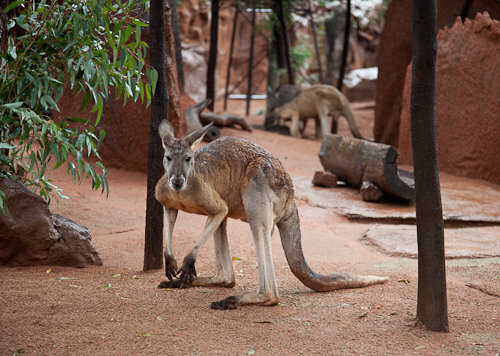 In Australia, weird food means bush meat like croc and emu, but the most common and widely available game there is kangaroo. 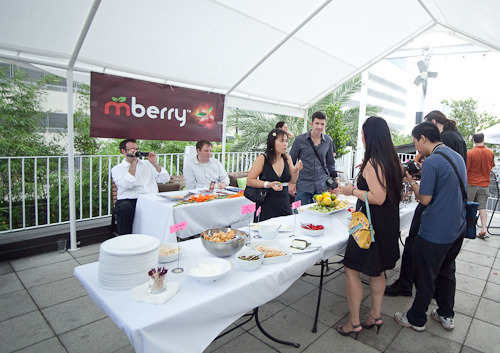 Recently, we were invited to a flavor tripping party hosted by the Berry Fairy, Jenny Wang. We’ve already written about flavor tripping tablets here, so this article will cover flavor tripping with the actual Miracle Berry fruit and combine tasting notes from TastingBuds Peter and Kristina. After reading a New York Times article about flavor tripping, we wanted to try it out the palate-altering “miracle berry” that turns sour and spicy flavors sweet. Luckily for us, a friend had some flavor tripping tablets and was hosting a flavor tripping party. At his house, we were “taste tripping” while eating an impressive spread of fruits, cheeses, and beers in a fun altered state where most foods tasted much different than normal! We sampled so many different interesting flavors, and now a guest post from our flavor tripping party host, fellow food lover, Vicente Gonzales, AKA “V”. Bizarre Bug Eating – You Ate What? Recently, I’ve been watching TV shows like Man vs Wild and Bizarre Foods. Seeing Bear Grylls and Andrew Zimmern eat the grossest / weirdest stuff in the world (and miraculously not dying) sort of makes me want try it too – almost as if they are daring me to do it too! 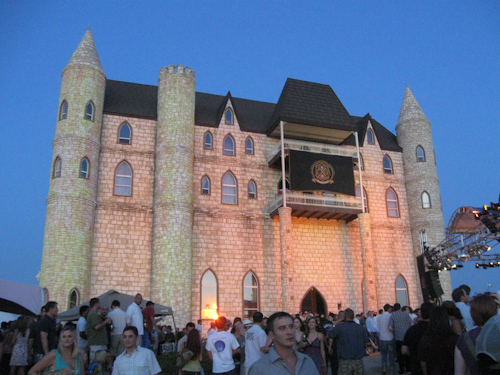 While I don’t think I’ll be eating either a yak’s eyeball or a still living tree frog (that’s disgusting Bear Grylls) any time soon, I was intrigued when I heard that there would be an edible bug sampling at the “Most Interesting” party at Falkenstein Castle near Austin, Texas. 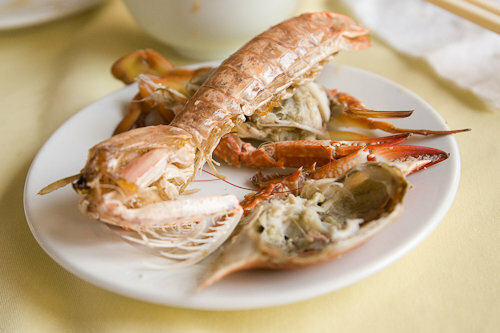 Today’s “You Ate What” adventure takes place on a boat cruise through beautiful Halong Bay, Vietnam. On this amazing trip, we visited a floating live fish market literally built into the middle of the bay, where I ate some of the freshest and tastiest food I’ve ever had in my life. The market vendors sold all sorts of fish, clams, crabs, and fruit, but the absolute best thing I had there was the delicious and somewhat unusual mantis prawn. Being a foodie isn’t always about eating fancy 3 course dinners consisting of food that’s hard to pronounce. On the contrary, often the best tasting foods are inexpensive, hearty working class comfort foods. In Austin, a perfect example of great everyday, utilitarian food is the breakfast taco. Arguably one of the best breakfast tacos in town is the huge ‘Don Juan’ (made with a generous serving of potatoes, egg, bacon, and cheese) at Juan in a Million, a mecca for hungry diners in East Austin that hosts an eating challenge so infamous it was recently featured on The Travel Channel’s volume eating show, Man v Food. 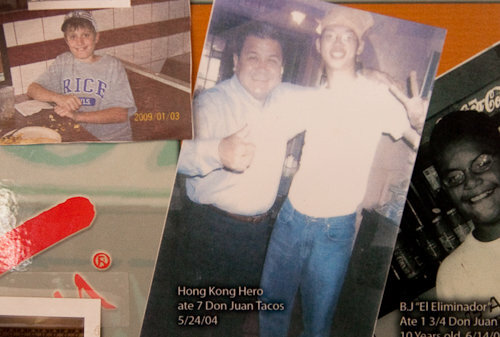 In the Austin episode of Man v Food, host and eating challenge extraordinaire Adam Richman attempted and failed to break the Don Juan Challenge record held by Christopher “Hong Kong Hero” Huang, who in 2004 ate an astonishing 7 Don Juan tacos in one sitting! Huang, who set the record while he was a student at the University of Texas in Austin, has worked many jobs in the food industry including selling peanuts at a ballpark, delivering pizza, serving in a fine dining restaurant, and his current job managing Berripop, a frozen yogurt store in Houston, Texas. Fooding blog pulled Christopher away from his busy schedule long enough to ask him about his amazing record and to get inside the head of a certified eating champion. Click here to read more about the life of an eating Champion!